Like the rest of the world, I was very excited when it became known that JK Rowling was writing books for adults. I read The Casual Vacancy about a year ago, but a year later all I remember was that it was okay…with a lot of characters to keep track of. The Cuckoo’s Calling, however, has one strong main character, good supporting characters and an interesting story. 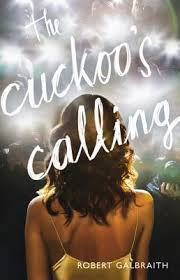 The main character in The Cuckoo’s Calling is Cormoran Strike, a private detective whose business is failing. Strike’s creditors are circling and the love of his life has kicked him out of her home, leaving him sleeping on a camp bed in his office and showering at a local gym. When a temp agency erroneously sends him a secretary, Robin, Strike is too embarrassed to send her away, even though he hasn’t had an business-related email or phone call in weeks. Luckily, John Bristow, who was the brother of an old school friend of Strike’s, employs Strike to investigate John’s sister’s death. (Luckily for Strike I mean, not the victim. Not that it matters though, the victim is a made up character for the book. You know what I mean). Bristow’s sister was a supermodel known as Lula Landry, who died when she fell from a balcony. Lula’s death was officially recorded as a suicide, but Bristow believes Lula was murdered. The story is told in chapters which move back and forwards between Strike and Robin’s viewpoints. Strike is a former soldier with only one leg. Despite Strike having the face of a boxer, pube-like hair (the author’s description, not mine), overweight and a smoker, he comes across as surprisingly attractive. There is also an undercurrent of an attraction between Strike and Robin, although maybe this is more on Strike’s side than Robin’s. Strike certainly admits to himself he is in an emotionally vulnerable state after his recent break up. Robin is a good secretary, empathetic and smart. I liked her character very much and hope that in future novels she evolves further. In this story, Robin was newly engaged, and spent a lot of time admiring her engagement ring in an unsustainably happy state. As we all know, that can’t last forever, but I’m sure she has more to offer. She certainly didn’t like being left behind in the office while Strike got to do the investigating, but maybe if Robin makes it into the next book she can wear that glamorous green dress of her own). Strike’s investigations find that the Bristow family was (and is) dysfunctional, (although aren’t all families?). Lula, John and Charlie Bristow, who Strike was friends with in childhood, were all adopted by Sir Alec and Lady Yvonne Bristow. Lady Bristow is now dying of ovarian cancer. John works in the family law firm with his uncle, who holds most of the family Bristow in fairly low esteem. There are a number of potential murderers, from Lula’s no good boyfriend, her junkie friends, fellow supermodel and celebrity designers, family members and wannabees, who are desperate to be rich and famous too. The story moves along quickly and provides enticing glimpses into the lives of the beautiful, rich and famous. There is one thing about the story that really annoyed me which I want to have a whinge about but can’t as it is a massive spoiler, but regardless, I would read more novels in this series and by this author, even if the author was the unknown “Robert Galbraith”.